These are the terms and conditions (the "Terms and Conditions") for using the beIN SPORTS CONNECT service ("Service") delivered via one of beIN Asia Limited (HK)’s ("we", "us", "our") website or applications (“Applications”). This Service is provided to you, the user ("you", "your") on the basis that you accept the terms of this contract. It is a legal agreement and it sets out your rights and obligations and our rights and obligations. By using the Service (including by installing and using one of the Applications) you are agreeing to be bound by these Terms and Conditions. (a) abuse your access to the Service or use it for any unlawful purpose; (b) access the Service in a way that may cause the software, applications and other equipment used by us to provide this Service (the "System") to be interrupted, damaged, rendered less efficient or impaired; (c) access or record the Service or any content in any manner which violates or infringes the rights of any person, firm or company (including without limitation rights of intellectual property, confidentiality or privacy); (d) reproduce (other than for your own private viewing in accordance with this agreement and applicable law), modify, distribute or publish the whole or any part of the content of this Service without our prior written permission; (e) sell, assign, transfer or delegate to another person or entity all or any of your rights and obligations in the Service or any part of it; (f) broadcast, publish, communicate to the public or otherwise distribute or disseminate the Service, or any content from the Service, to the public or for any commercial purpose. As part of the Service, you may receive push notifications, email messages, text messages, MMS messages, or other types of messages directly sent to you (“Push Messages”). You may control the Push Messages in your device’s settings. Some of the Push Messages may be related to your location or to your use of the Service. Your carrier may charge standard messaging, data, and other fees for use of Push Messages, and these fees may appear on your mobile bill or be deducted from your pre-paid balance. Your carrier may prohibit or restrict certain Push Messages and certain Push Messages may be incompatible with your carrier or mobile device. Contact your carrier with questions regarding these issues. You may discontinue Push Messages in your device’s or the Application’s settings or by deleting the Application. We may collect information related to your use of Push Messages. If You have registered for Push Messages, You agree to notify us of any changes to your mobile number, as applicable, and update Your Account to reflect this change. You must pay the subscription fee (the "Fee") applicable to the specified Service which you have subscribed for, in accordance with the fee plan notified to you at the time of registration or at the time of renewal of your registration. This is a recurring subscription and therefore your card will be debited in advance every month if you choose the Monthly Subscription and every year for the Annual Subscription. You can cancel your subscription at any time, but only as set out in, and subject to the terms of, clause 4 below. The Fee will be automatically billed against the credit/debit card number that you provide in the registration form. You will be notified by email that we have debited your credit/debit card and that you have been granted access to the Service. The email message will constitute our acceptance of your request to access the Service. Our acceptance of your order will be deemed complete and received by you at the time and date we send the email, which time and date is specified on the email. It is your responsibility to provide us at all times with a current email address and we accept no responsibility for you not actually receiving the email for reasons outside our control. In the case of a monthly subscription you will be notified by email of the first payment only. We have the right to increase any or all prices on not less than 30 days notice. However, if you are on a Monthly Subscription, the increase will apply to the next applicable month and if you are on a Annual Subscription, the increase will apply to any renewal of your Annual Subscription. If you do not agree to an increase in prices and if you are on a Monthly Subscription you may terminate your subscription in accordance with this clause or, if you are on an Annual Subscription, you may elect not to renew your subscription. Subscribers to the Service may cancel their subscription at any time by accessing the Your Account section of the Service and selecting cancel or in the case of Applications, irretrievably erasing, deleting, or destroying all copies of the Applications in your possession or control. We do not accept cancellations over the phone, via post or any other medium. Subscribers to the Service will be entitled to a full refund only before first use of the Service. In all other circumstances, you will not be entitled to a refund of any monies paid, even if you cancel your subscription prior to the next scheduled payment date, including for Annual Subscriptions. We accept no responsibility for non-receipt of emails by us for reasons outside of our control. To the maximum extent permitted by law, we are providing the Service and System on an "as is" basis and make no representations or warranties of any kind with respect to either the Service or System or their content including (without limitation) warranties as to completeness, accuracy, satisfactory quality and fitness for any particular purpose, except to the extent required by law. To the maximum extent permitted by law, we do not warrant that the Service will meet your particular expectations or requirements or that it will be uninterrupted, timely, secure or error-free, nor do we make any warranty as to results or the accuracy of any information obtained by you through the Service. Certain legislation may imply warranties or conditions, impose obligations or give statutory guarantees (together, “Statutory Provisions”) which cannot be excluded, restricted or modified except to a limited extent. This legislation includes the Consumer Guarantees Act 1993 and the Fair Trading Act 1986. These Terms and Conditions must be read subject to the Statutory Provisions. If we incur a liability to you as a result of a breach by us of a Statutory Provision, or in the event of a breach of these Terms and Conditions by us, our liability is limited to one of the following as nominated by us in our discretion: (a) the resupply of any relevant service comprised in the Service; or (b) the payment of the cost of having the relevant service supplied again. We may suspend or terminate the Service or your access to the Service at any time in our absolute discretion and without liability to you if: (a) your access to the Service is considered to be in breach of these Terms and Conditions or (b) a court or competent regulatory authority requires our provision of the Service to be terminated. From time to time, your access to the Service may be suspended in order for work to be carried out relating to the upgrading or maintenance of the System or otherwise as necessary for the provision of the Service. We shall give as much notice as is reasonable in the circumstances and shall endeavour to ensure that such works are carried out as expeditiously as is possible in the circumstances. Subject to your payment of applicable fees and compliance with these terms and conditions we grant you a non-exclusive, non-assignable, and non-transferable licence to use, view and display, for personal use only, one copy of any material that you may be required to download in order to access the Service, including, but not limited to, any Applications, files, codes, audio, or visual images incorporated in or generated by the software (collectively "Downloaded Material") provided, however, that you maintain all intellectual property-related and other notices contained in such Downloaded Material. In the case of Applications we grant you the right to to download a single copy of the Application to your mobile device solely for viewing the Service through that device. You acknowledge and agree not to sublicense, assign, or otherwise transfer this license or the Downloaded Material. You also agree not to alter, disassemble, decompile, reverse engineer, or otherwise modify the Downloaded Material. You agree to fully indemnify us immediately on demand against all claims, liability, damages, costs and expenses, including legal fees, suffered by us at any time arising out of any breach of these Terms and Conditions by you (or any other user in your household or anyone else who may access the Service through your terminal using your password) or any other liabilities arising out of your or their use of or access to the Service and/or the System. You shall provide us with notice of any such claims which you receive directly, and, if requested by us, full authority to defend, compromise or settle such claims and reasonable assistance necessary to defend such claims, at your sole expense. You will have responsibility for payment of any and all taxes, charges, duties, excises, imposts or similar fees levied or imposed in connection with the Service, including any such amounts levied or imposed on us and we are entitled to pass on to you or recover any such amounts. Without limiting the foregoing, if we incur a GST liability in respect of the supply of services under this contract, the price otherwise payable by you for that supply will be increased by an amount equal to the amount of the GST payable. Unless expressly stated to the contrary, all prices given by us in connection with the Service are GST-inclusive. Any notices we send will be sent to the email address you supply during the registration process. 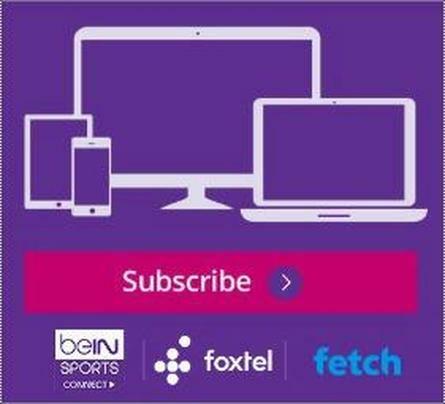 Other than cancellation requests, any notices or enquiries you send us should be sent by email to au-customerservice@beinsports.net. Notices will be deemed to have been delivered at the time and date of sending of the email, which time and date are specified in the email. If we fail to exercise or enforce any right we have under these Terms and Conditions such failure will not be deemed to be a waiver of that right nor will it prevent us exercising or enforcing that right on a later occasion. No refunds will be made in connection with any postponement or cancellation of events, or change in programming, for whatever reason. We shall take all reasonable steps to ensure a high quality video feed. However, we cannot control Internet network congestion that may occur and affect the quality of the delivered video. We are not responsible for any suspension of service that may occur in the live video feed that is received from other broadcasters. For this Service we will accept registrations only from residents of certain geographical areas. This will be indicated clearly at the time of signing up. You warrant that all information provided by you is true, accurate and current. If we believe you have provided false information, we reserve the right to terminate this contract and your access to the Service. We will not be liable to you for any breach of these Terms and Conditions by us due to any cause beyond our reasonable control. We reserve the right to vary and/or update these Terms and Conditions from time to time by written notice sent to your then current email address. If you consider that a variation or update to these Terms and Conditions affects your ability to use the Service or if you do not accept such a variation or update please contact us setting out your concerns in writing in an email to nz-customerservice@bein.net and we will contact you in relation to your concerns. If you continue to use the Service after the date upon which you are notified a variation or update to these Terms and Conditions becomes effective, you will be deemed to have accepted the variation or update. We may assign or transfer all or any of our rights and/or novate our obligations under these Terms and Conditions to a group company or other third party, provided the transferee is able to continue to provide equivalent Services. In the event of assignment or transfer, notification will be given to you by e-mail. These Terms and Conditions constitute the entire agreement between us and you with respect to this subject-matter and exclude any representations or warranties previously given or made. These Terms and Conditions and your access to and use of Service are subject to the laws of New Zealand and you submit to the exclusive jurisdiction of the courts of New Zealand.